For an island, Ireland keeps pretty quiet about the wonderful beaches here. True, they are not really great places to lounge in the sun sipping fruity cocktails, aside from a few days a year if we are lucky. (And good luck is one our Irish gifts!) But a coastline does surround the island, framing the famous forty shades of green, and it features some truly magnificent beaches. Let’s be clear about what a beach is and what a beach is not, because Ireland has a lot of amazing spots along that coast that are well worth a visit, but are not beaches. The Cliffs of Moher is not a beach, for example. A beach is a sandy shoreline where children can make sandcastles and collect shells while their parents relax on a blanket or lounger nearby. It might be quiet and off the beaten track, or it might be a touristy spot with shops selling Irish gifts, ice cream and buckets and spades. If you are looking to feel some sand between your toes in Ireland, you have an instant short list of brilliant beaches in the form of the Blue Flag award. Blue Flag status is awarded to beaches that meet 32 criteria in the categories of environmental education and information provision, water quality, environmental management and safety and services. This means the beach will be clean and far from any industrial or sewage discharges. It also means that a lifeguard will be on duty daily in July and August and on weekends in June and September, unless the beach has an exception. While the beaches are assessed annually for the Blue Flag award and subject to change, you can usually count on finding a Blue Flag beach near some of Ireland’s best loved destinations. 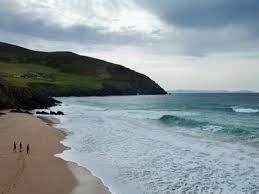 The Dingle Peninsula in County Kerry offers three Blue Flag beaches this year. Bundoran in County Mayo is a spot loved by generations of Irish families, and the beach there has Blue Flag status. Salthill, just outside of Galway town, is another popular beach with Blue Flag status. You can even find beautiful Blue Flag beaches just north and south of Dublin City that are easily accessible by public transport. Actually, you don’t have to go to the coast to find a Blue Flag beach; some of Ireland’s inland lakes have earned the flag for their lovely beaches. These beaches feature the best of what we love as Irish; gifts of natural beauty, a chance for the family to relax together away from the hustle and bustle, and an atmosphere that is just a touch wild and magical. We don’t have many days when sunbathing will be all that appealing, and you’ll see a few wind shelters on most Irish beaches, but nonetheless any trip to Ireland should really include a day at the beach. It’s an island after all, and you are spoiled for choice with beaches on the Atlantic and on the Irish Sea. To really capture the flavor of an Irish day at the beach, make sure to get a 99 – a vanilla ice cream cone with a small chocolate bar adorning it. When Is the Best Time for an Irish Wedding?